To avoid taking Gale's thread off on a tangent, I thought it best to move the air brush discussion here. 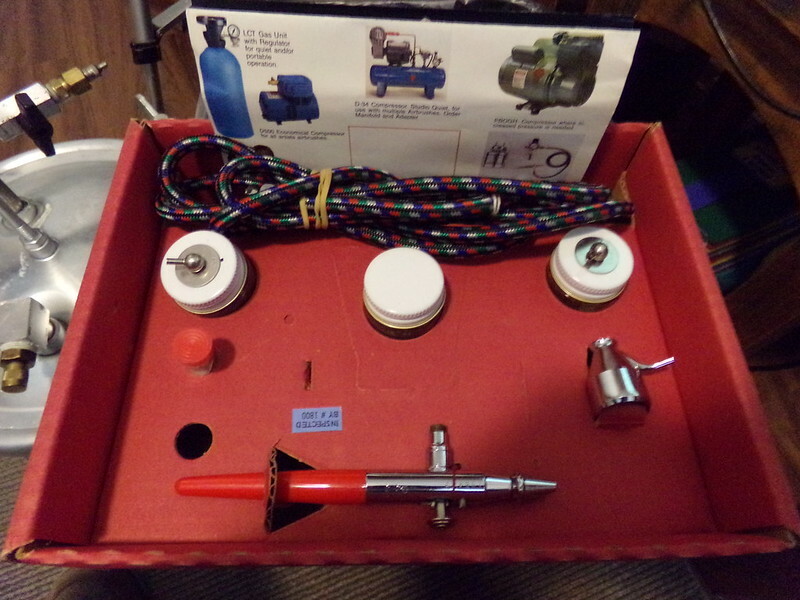 Here's a photo of my air brush. Its the 1st one like this that I've tried to work with. The instructions are very limited. There's pretty much no info on how to set it up or operate it. Whlie trying to apply paint, the product seems to surge, making it hard to get a consistent spray. The instructions say to keep the air pressure below 60 psi. To get it to spray, the pressure has to be close to 60. The 1st attempt was with Testors Aztec water based air brush red paint which is supposed to be pre-thinned for air brush use. The surging paint presented a challenge but the 56 Ford truck came out ok, but dull. Round 2, was with Aztec neon pink, which seems much thinner. Application was thin and runny. The 56 delivery was the victim. Stripped it down to try again. This is time the paint was bottled lacquer automotive touch up paint, thinned down. Results were a little better but still uneven. Sanded and polished it out, to prep for clear coat. After a while it started looking pretty good so I went with an old fashioned hand rubbed lacquer finish. The 56 Delivery's finish is pretty good but needs something to brighten it up. I'm glad you started a new thread, Bill! Gonna be a lot easier for everyone to find this info. Your airbrush looks identical to mine that I've been trying to use. Same issues with the surging & dullness when using acrylic paint. 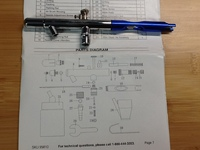 I can't find it now but read on the net a while back that #5 O-ring and mine has a small O-ring on the nozzle (part #3), that those were a possible area of concern for air leakage and they suggested a small amount of beeswax to seal it up. I haven't tried it yet but made sense to me at the time. I probably won't get back to that until after the race but when I do, I'll let you know if any thing changed. I'm sure you know also that part #11 is less than easy to re-assemble. I don't always tear mine all the way down but when I have, I've always spent more than a few minutes on that sucka. I hope others will share their experiences and advice in your thread. Great Idea! EDIT: I've been running mine at about 40-45 psi, don't know how accurate the gauge is though. Bill what is the brand name of your airbrush? Have you tried Googling some info or a Youtube search? 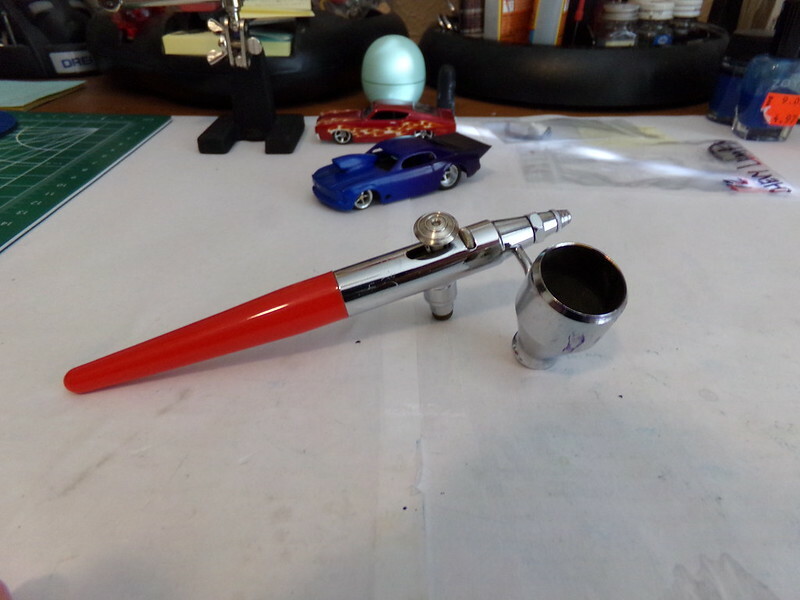 Let me say again that I still consider myself a novice with the airbrush, but I made the switch from rattle can to airbrush a couple of years ago and vowed to use the airbrush exclusively no matter how much trouble I might have. The only time I use the rattle can now is for some basecoats....white, black, and silver. I also almost exclusively use lacquer as it seems to present the least amount of problems on the paint side of things. But I do still use some acrylics. As with all paints thinning is ultra important to get it right....especially acrylics. I found a formula for mixing my own acrylic thinner which has helped tremendously but still not without issues. A flow aid is a necessity I have found. So to me it all starts with the paint. I clear coat everything I do and started using a two part urethane clear last year which is a whole other learning curve but well worth it IMHO. It looks like you are using what I will call an external brush (unless the cup has a dip tube)...meaning the paint is sucked into the airstream near the tip and doesn't actually go through the internal part like a normal automotive spray gun. I started with one of those but now use what I call an internal type. As I said in Gale's thread, it is a Paasche Type V which is an older but very common and popular brush. I may progress to a newer and better style at some point, but for now and my learning curve it suits my needs perfectly and will do anything that I want to do from fine detail to base paint. I've learned all about the learning curve and have found that repetition, practice, and learning about my unit is about the only thing that really works. For normal paints...acrylic or lacquer I run at around 35 - 40psi but can control the pressure with the trigger. For the 2 part clear I have to run it at 40 - 45psi since it is not supposed to be thinned. There are soooo many different brands and styles of brushes out there it just becomes personal preference I think. I would suggest playing around with your unit by just spraying straight alcohol or maybe even water to visually get an even non surging spray through the brush then move to paint so you can actually see the pattern on a surface. Any how to's that I've found always talk about practicing control of the pressure and using a flat surface to see the spray pattern. I don't know if any of this will help and I know I'm stating the obvious on some things, but these are things I've either read or seen for myself. As I have been typing this, I was applying a second color to my current custom body which happens to be Testors Model Master acrylic. I thinned it too much and the first couple of coats were too runny and were mottling really bad. Cause.....I thinned it to much. Once I added more color to the cup and thickened it up a bit the application cleaned itself up and went on even. Sometimes there is a very fine line of too thin vs too thick. Once again...lacquer seems to not be so temperamental. If you tell me the brand and/or type of your brush I will see if I can find some info. on it. Hope this helps. Found that beeswax info. Although it's a different airbrush, I would think the principle might be the same. Also read where some have used chapstick instead of beeswax. Also, I don't know where Bill got his but mine came from Harbor Freight, it looks identical. Here's a link. I use a lot of Harbor Freight tools in the hobby and most work well. My airbrush compressor is from there and it has been good so far....knock on wood! But other stuff not so much. It might be worth it to find an inexpensive higher end unit?? 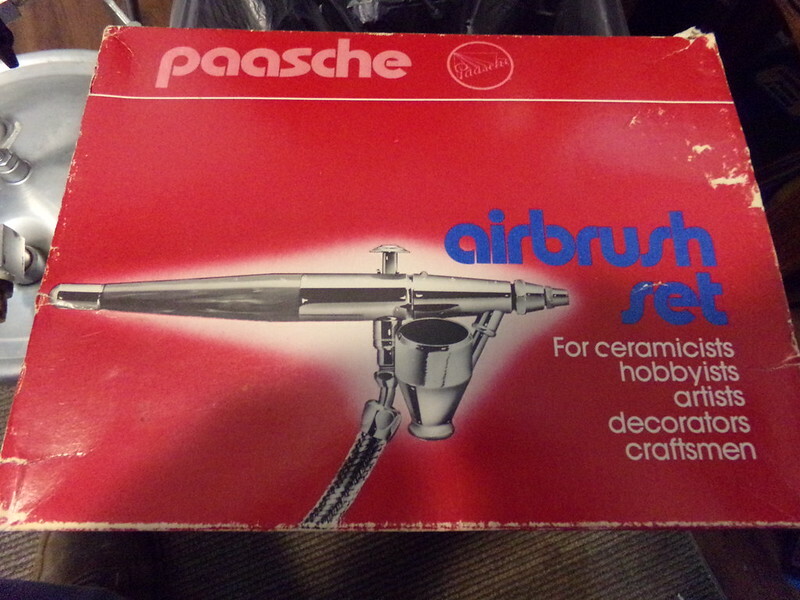 My first Paasche Type V was actually given to me and it had a cupful of rock hard dried paint in it and the internals. After some soaking in lacquer thinner and multiple scrubbings it is the one I know use. But I did find this almost new complete kit on Ebay for $40. The picture on the front actually shows a different (maybe older) version of what was actually in the kit. The Type V has two different needles which I did not have, but the kit had everything and gave me a backup unit. $40 was well worth it. Just a thought. spray cans and it is worlds easier to me. Thank you for your responses. The information you provided and the video are very helpful. My guns are also from Harbor Freight with the brand name of Central Pmeumatic. Both are new as far as usage but have had them for several years. Sorry my knowledge of airbrush terminology is not strong. This type of gun is new to me. I started out with a simple Badger years ago. The jars screw directly to the bottom of the gun. Perhaps it's called a single action. It was a step up from rattle cans. Used it primarily for spraying RC car bodies. Also used a few equivalent guns from other manufacturers. The bees wax seal and needle polishing look like good ideas to try. I'll have to give them a shot. Lacquer does seem to be a very forgiving media. It's probably the safest choice while learning. Jeff you're right that we should not expect top quality results with a cheap gun. After I get the basics down, I may want to upgrade. This may turn out to be a really interesting thread. Bill and Gale let me say again.......I am far from an airbrush artist and my terminology may not be correct either. What I've posted is a little bit of what I do know....my own personal experience....and my opinion on a few things. I don't want to come off like I know a lot about it though. I am still deep in the learning curve but am progressing. I do want to be as good as some of the elite artists that we do have here on the forum someday....so I keep at it. But if I can ever help, that's what I want to do. I agree that this could turn out to be a great thread....and I hope it does. There is a wealth of airbrush tutorials on Youtube. Been watching used air brushes on ebay. Don't know anything about it but looks like a good deal on this Paasche VL link it's over in an hour and 40 minutes. Appreciate the tips and video links guys! 1st air brush paint job was the Sanford and Son truck, sprayed with Testors Aztek water based paint. Finish has a low luster gloss. 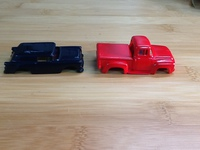 The original Sanford truck had no gloss, so that's ok.
2nd successful job was the 56 Sedan Delivery, painted with lacquer auto touch up paint. Polished it to a nice gloss but it looked bland on the chassis with black wheels. Added light blue flames to spice it up a little then clear coated. #3 was the 62 Vette , once again using Aztek water based paint. Finish looks a lot like an automotive base coat. Masked it to paint the coves but the paint pealed of with the tape. Stripped it and started over. This time, clear coated it and made decals for the coves. That Vette is stunning Bill. A little side note that you guys may find interesting. The glass for the Sanford and Son truck was purple with riddles printed on it. That just wouldn't do on a red truck. Dropped in in the vat of paint stripper, hoping to get the lettering off but in a few minutes the glass was clear. Polishing it with Maguires clear plastic polish finished the job. Never would have guessed that the tint was sprayed on. Always thought it was colored plastic. Beautiful cars and haulers Bill.....and that Vette is sweeeeet! I never would have guessed that colored plastic was tinted either.